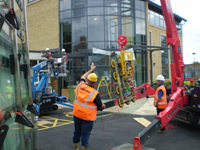 We hire cranes and access platforms. 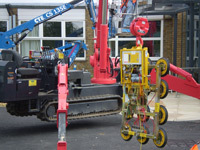 Pannkoke and Unic Spider crane. An excellent all rounder, this 600kg capacity dual circuit Kombi 7211-DS2 offers lockable tilting at 15° intervals. 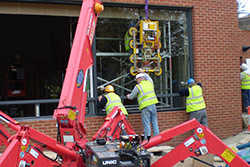 Extension arms and supplementary pads are supplied as standard, giving a 2.8m pad spread for extra stability when handling large pieces of glass. The DS2 features manual rotation through +/- 90° and individual pad shut-off valves to help accommmodate irregular loads. Dual circuit vacuum system with 1 pump and 2 vacuum tanks. 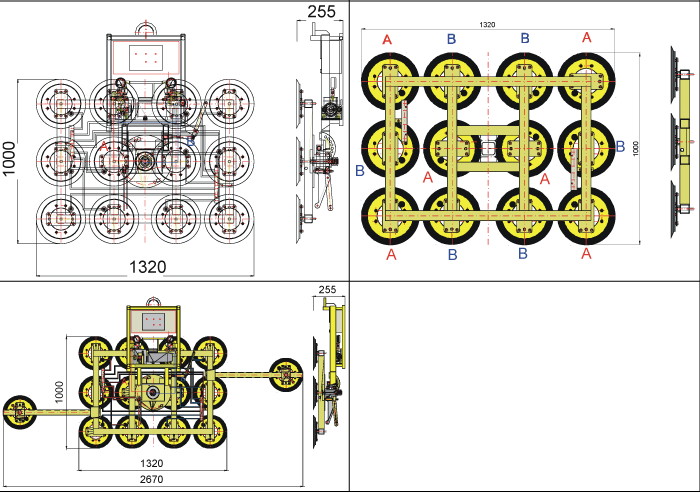 The structural depth of the lifter is 255mm approx. 12 volt DC pump from rechargeable battery. Battery Charger 110v/240v 50/60Hz single phase.